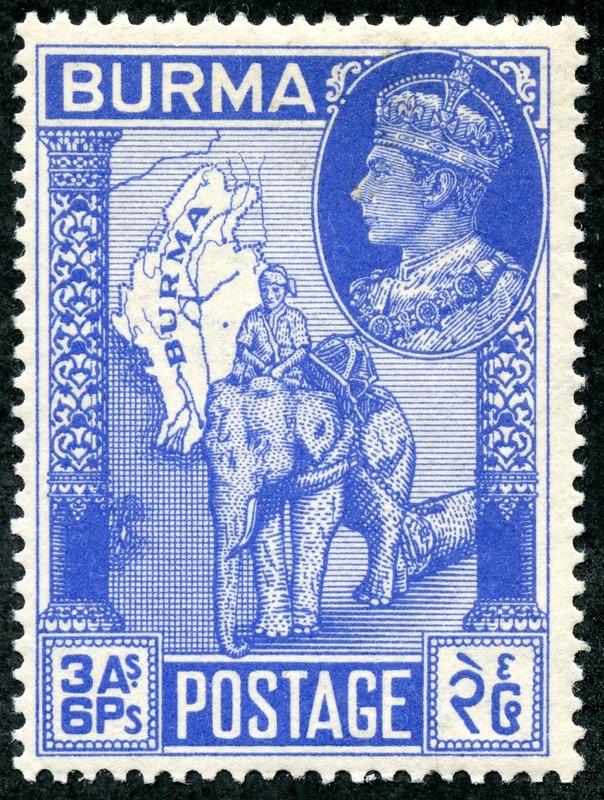 Stamps of India were used in Burma from 1854 until April 1, 1937. It then became a self governing unit of the British Commonwealth with a constitution. 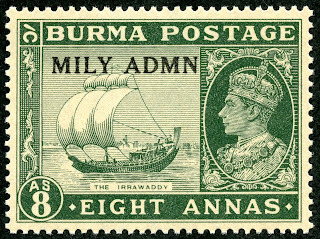 It became totally independent in 1948. 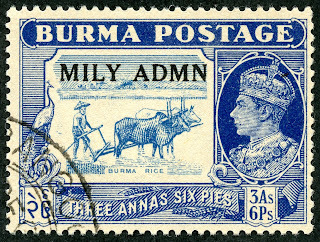 The original blog post and BB checklist for Burma is here. The stamp history is interesting enough that I will split the presentation into two parts. 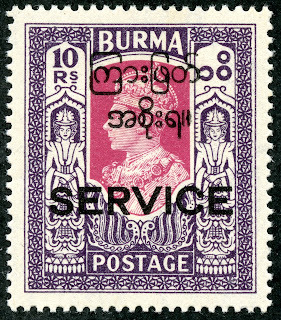 Part 1 (this one) will look at the regular and official British Commonwealth issues of 1937-1940, and 1945-1947. 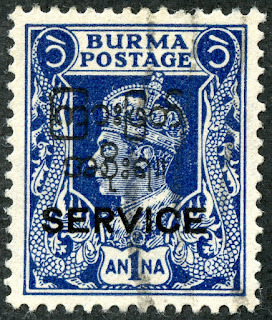 Part 2 will look at the interesting 1942 Burma Independence Army issues (under Japanese authorization), and the Japanese occupation stamps of 1942-1944. Then we will look at the issues of the independent Republic from 1948-1949. 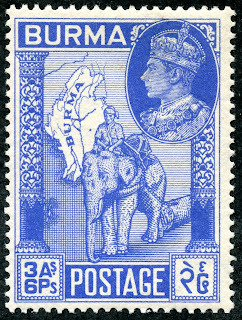 1937 Scott 8 3a6p deep blue "George V"
As noted, Burma came under British administration on April 1, 1937 after having had been a province of India since January 1, 1886. 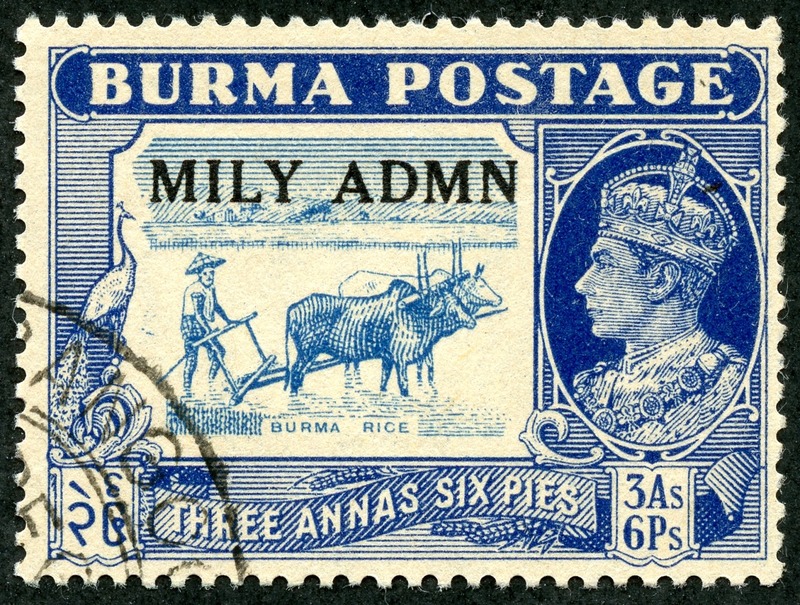 An 18 stamp issue was released by overprinting "Burma" on 1926-36 stamps of India. The overprint was on top of all stamps, save for the 3a carmine rose, where the overprint is on the bottom. 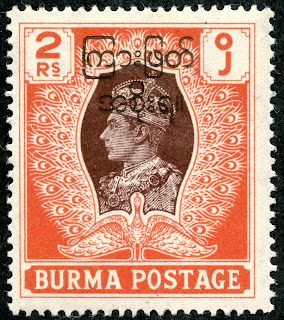 The small format 3p-12a denominations (12 stamps) have a modest <$1 CV for 11 stamps. 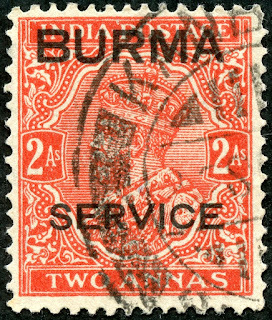 The 1r-25r denominations (6 stamps) are more CV expensive, ranging from $5+ to $550. 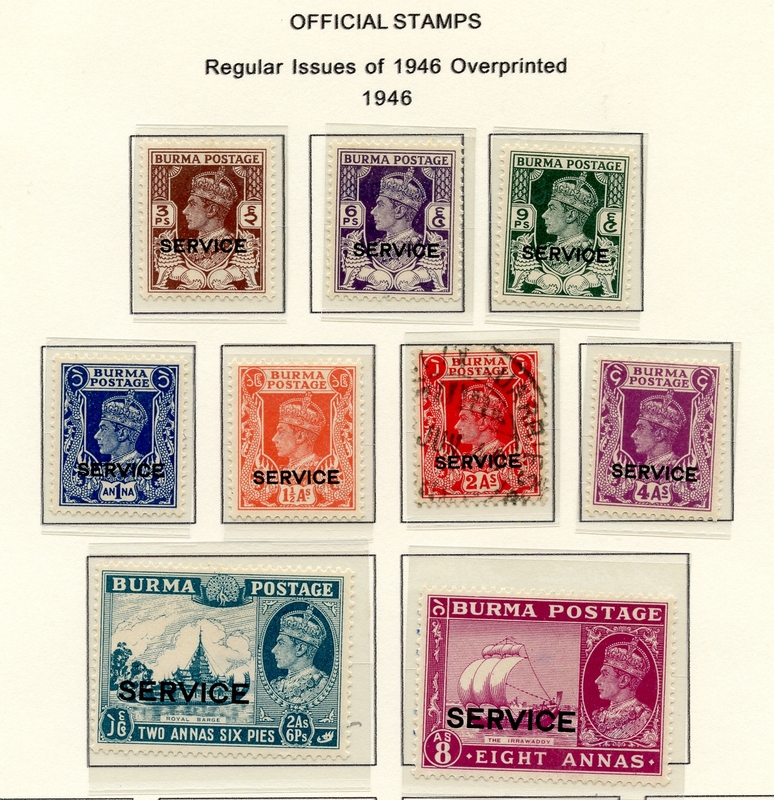 Also, during April-June, 1937, officials - an issue of 14 stamps - were produced by using the 1926-1934 stamps of India. 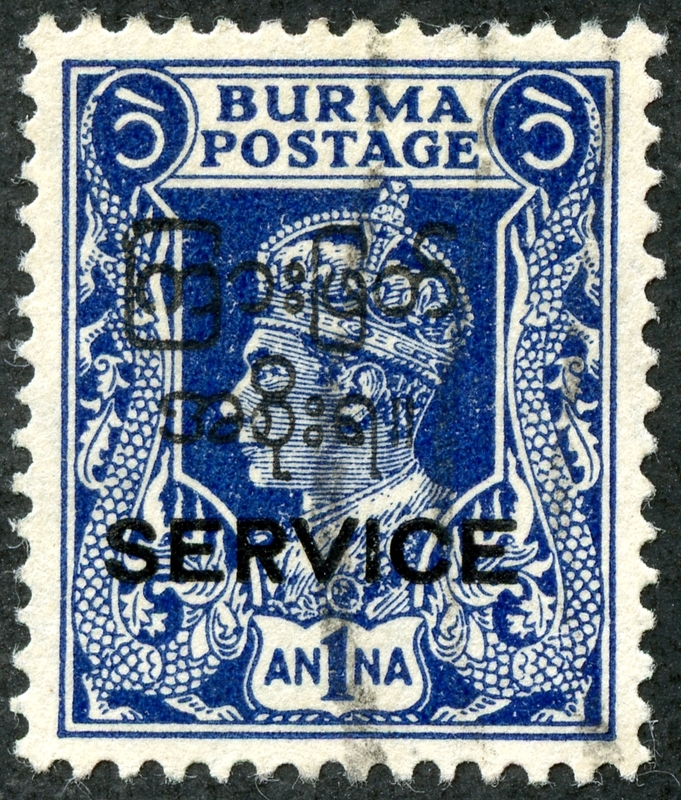 The "Burma" and "Service" overprints were either applied separately or together in one operation. CV ranges from <$1 to $300. 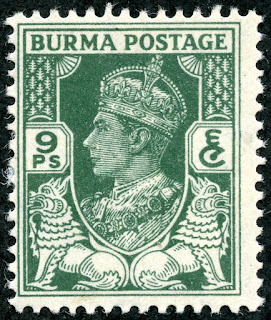 1938 Scott 21 9p yellow green "George VI and Chinthes"
Burma received their own stamps ( with a George VI visage) on November 15, 1938. 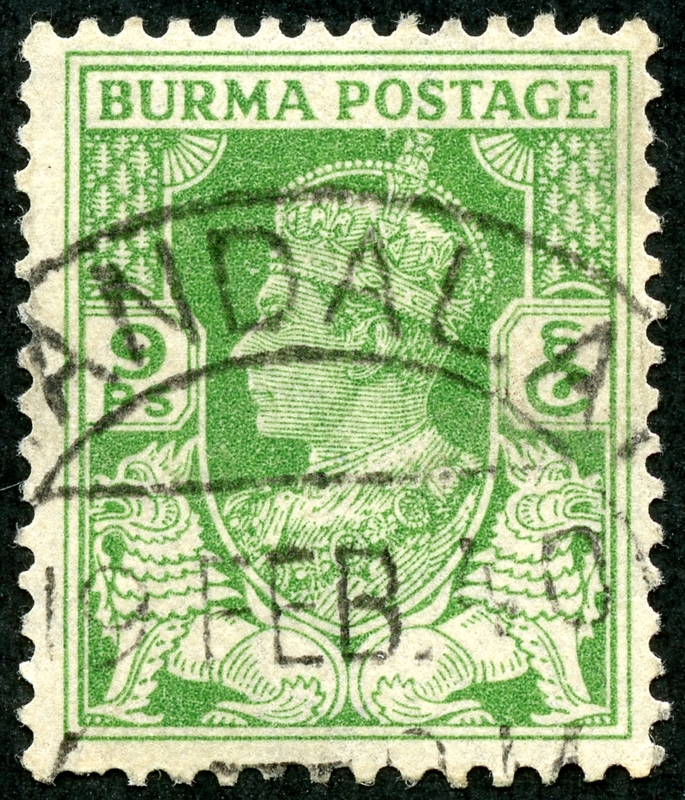 The eight stamps that were of (mostly) lower denominations had two local motif designs in the frames. The one as above shows "Chinthes", a lion like creature that guards pagodas and temples. The four middle denominations are pictorials, and in my opinion, the class of the lot. Look at this image! I wish all British Commonwealth stamps were like this. The four higher denominations were bi-colored. 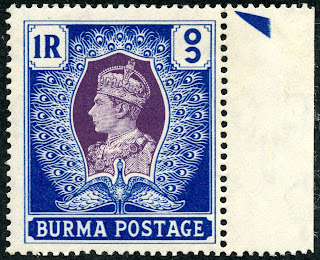 The 1r shows George VI enveloped in a peacock! 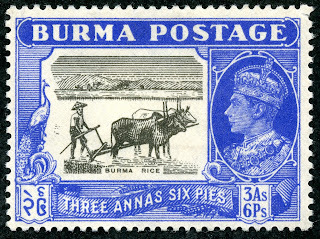 The Official stamps were made by taking stamps from the 1938 issue and overprinting them in black. 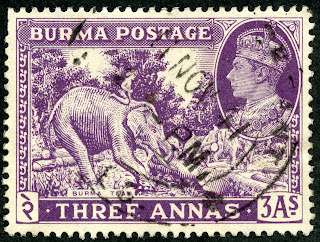 This 1939 Official issue consists of 13 stamps. 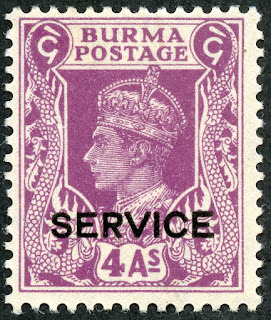 1945 Scott 41 2a carmine "George VI and Nagas"
From May, 1942 until November 1, 1944, Japanese occupation occurred, with stamps issued by them or their surrogates. The British Military began plans for liberation in 1943, with operations against the Japanese increasing toward the latter half of 1944. 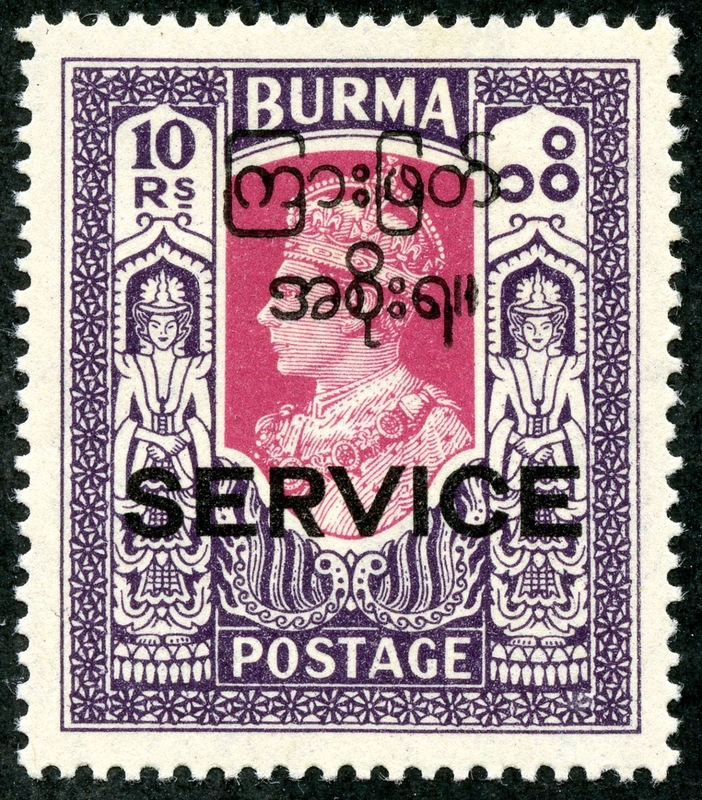 Postal services for the civilian population started in April, 1945, with Mandalay (June 8) and Rangoon (June 16) opening on the dates noted. 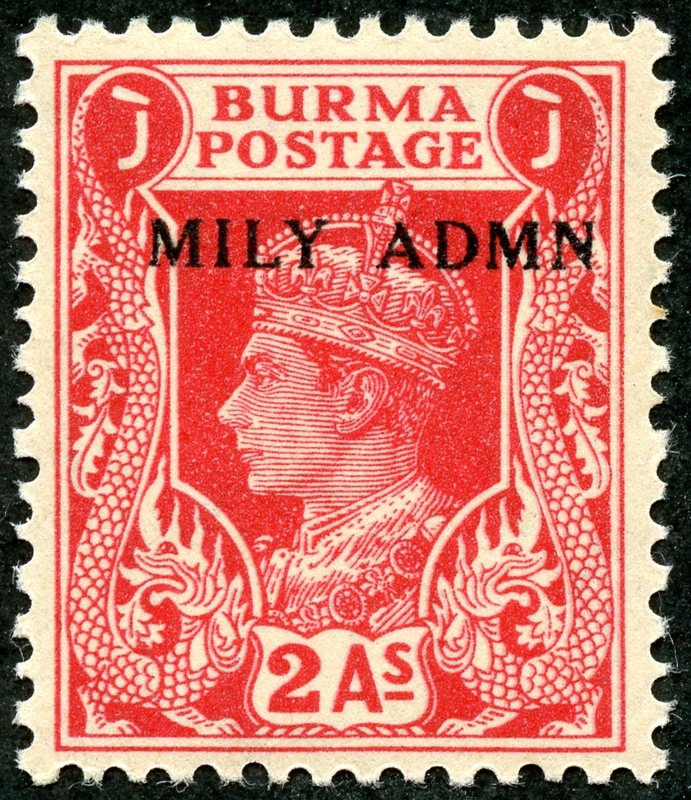 The British Military Administration continued through the end of 1945. 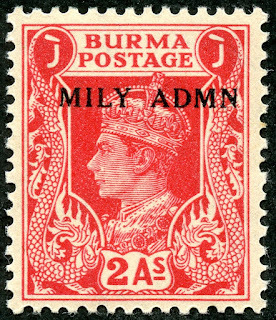 The stamp issues of 1938-40 (16 stamps) were overprinted in black "Mily Admn", and released in 1945. 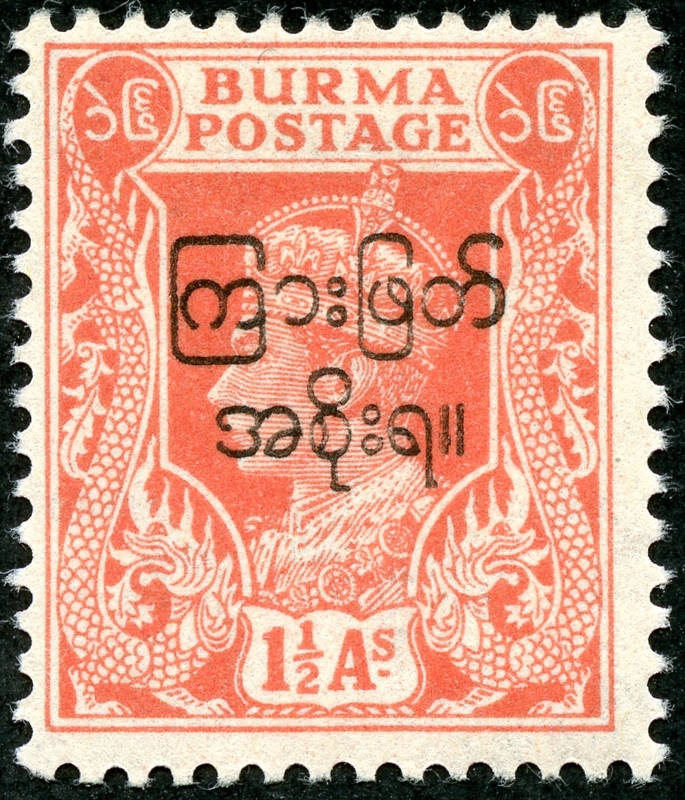 CV for the 16 stamp issue ranges from <$1 to $2+. 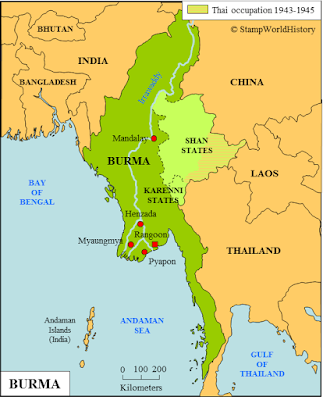 The Irrawaddy flows North-South in Burma (Myanmar), and is still today a very important commercial waterway. 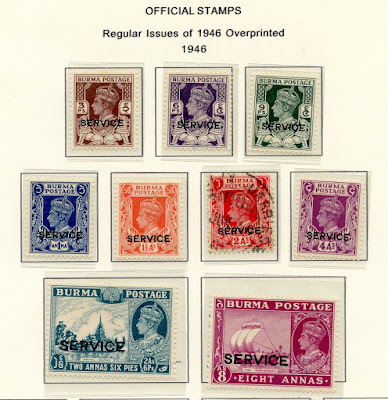 On January 1,1946, a "Types of 1938" issue, namely in different colors than the 1938 issue but using the same designs, was released. 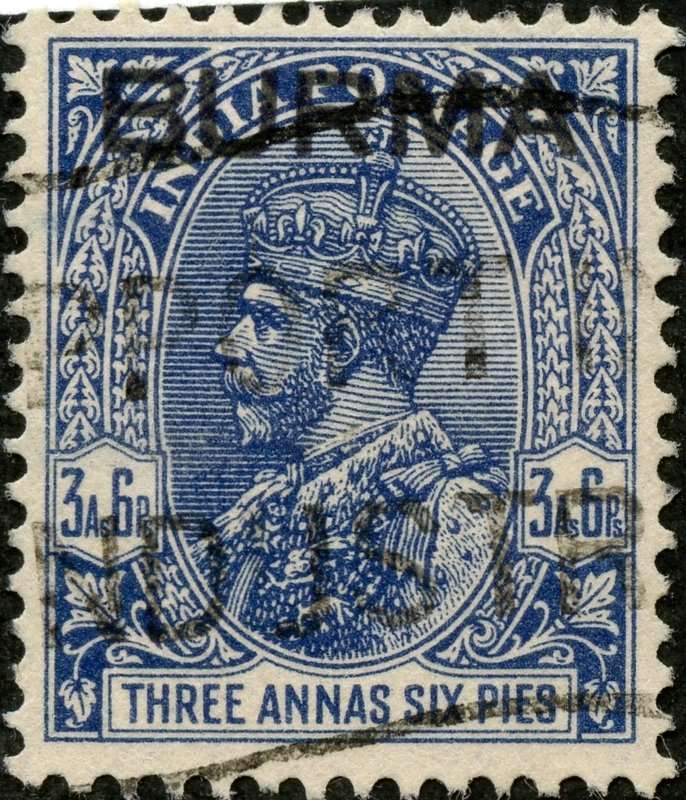 The issue consisted of 14 lithographic stamps, with the 15th stamp (1a deep blue) printed using typography. 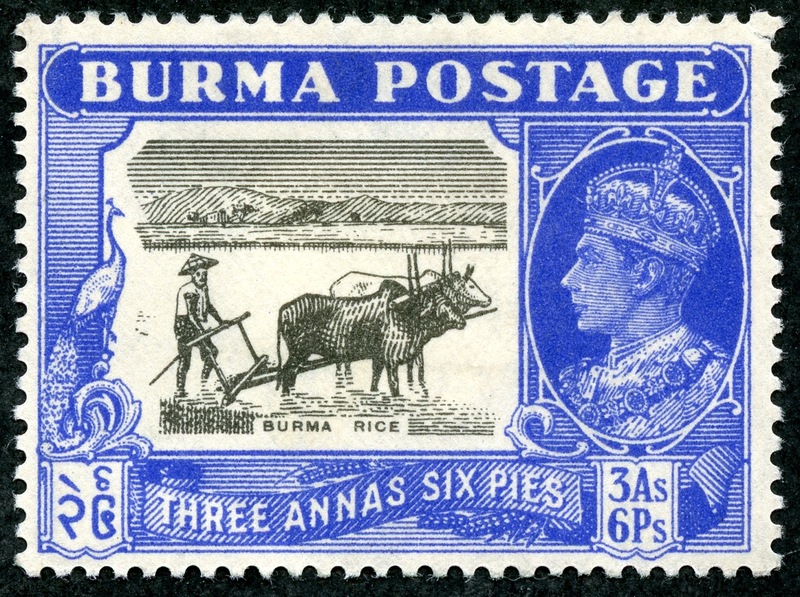 1946 Scott 58 3a blue violet "Burma Teak"
The issue has a CV ranging from <$1 to $25. 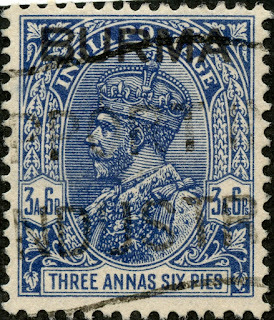 Note the fabulous blue violet color on this three annas! Normally, I'm not much of a fan of lithography during the classical era compared to engraving (tends to lack detail, have a dull washed out look, and subject to easy forging), but this design/execution/printing is great! 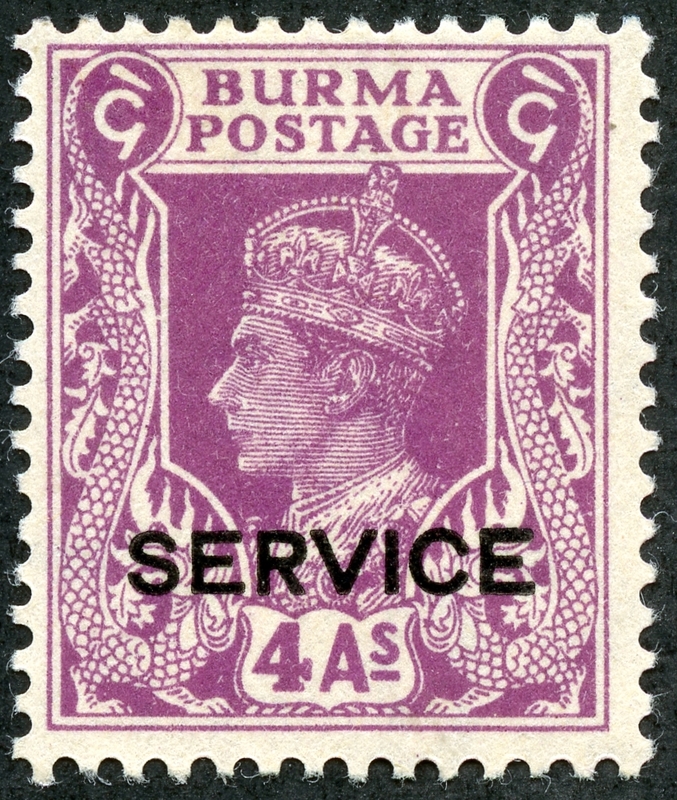 Official stamp were produced using the 1946 regular issue by overprinting "service" in black. 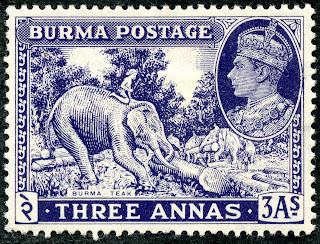 A thirteen stamp Official issue was released in 1946. 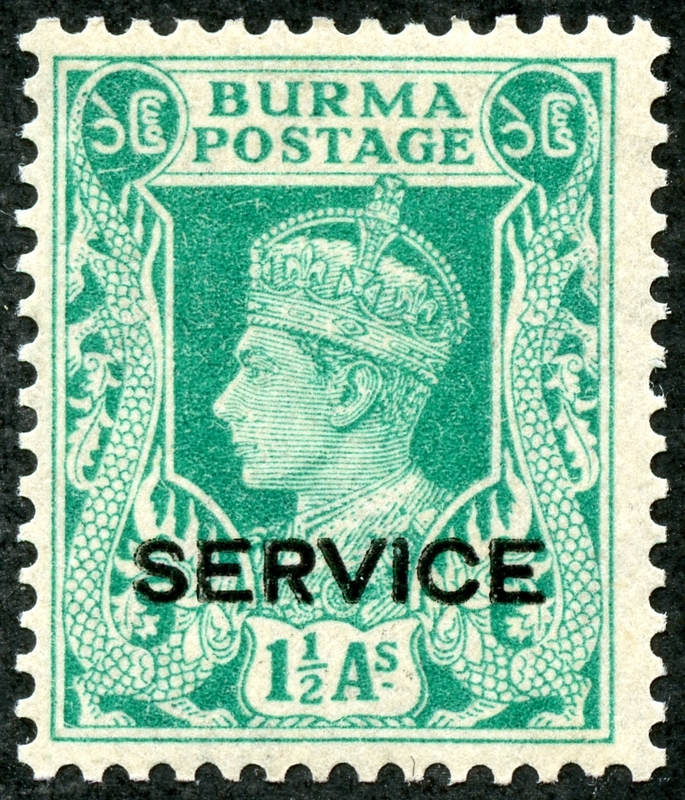 CV for the 1946 Official issue ranges from <$1 to $20. 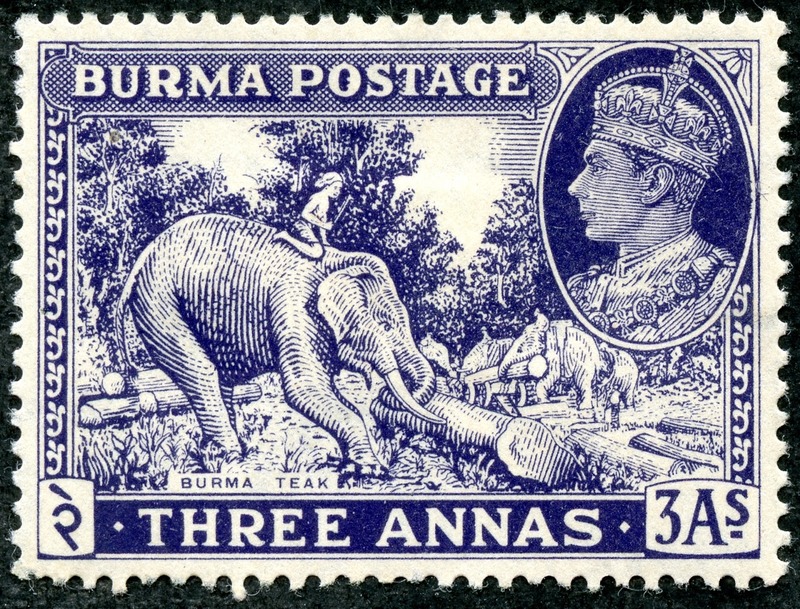 On May 2, 1946, a four stamp issue was published celebrating the victory of the Allies. 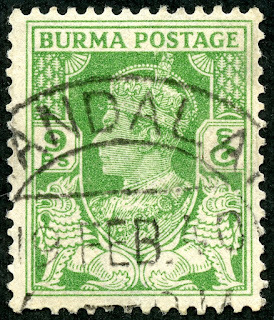 This would prove to be the last issue for the British administration. 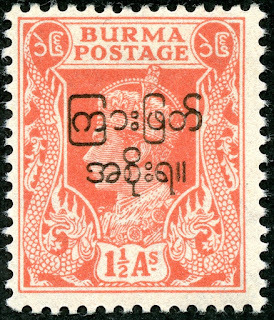 On October 1, 1947, a 15 stamp issue was released with a Burmese inscription overprint "Interim (Burmese) Government". 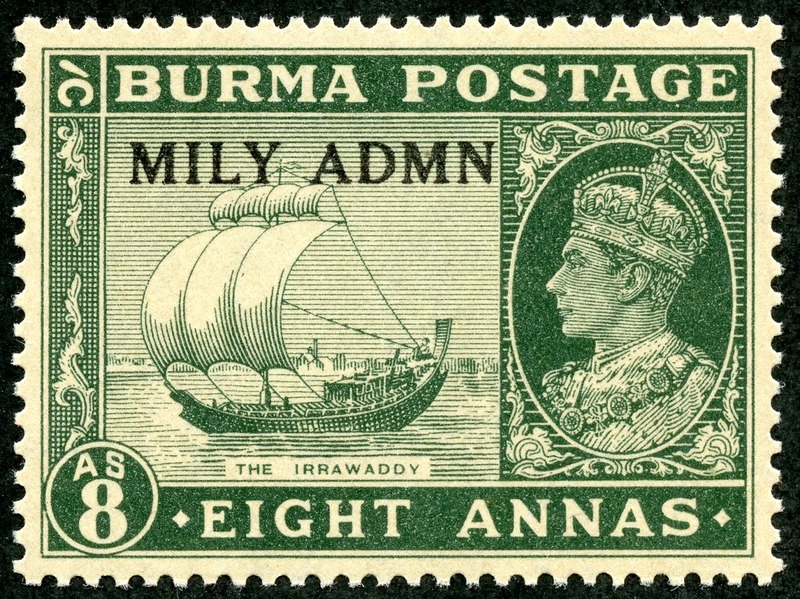 The overprint was applied to the 1936 regular issue. CV ranges from <$1 to $8+. 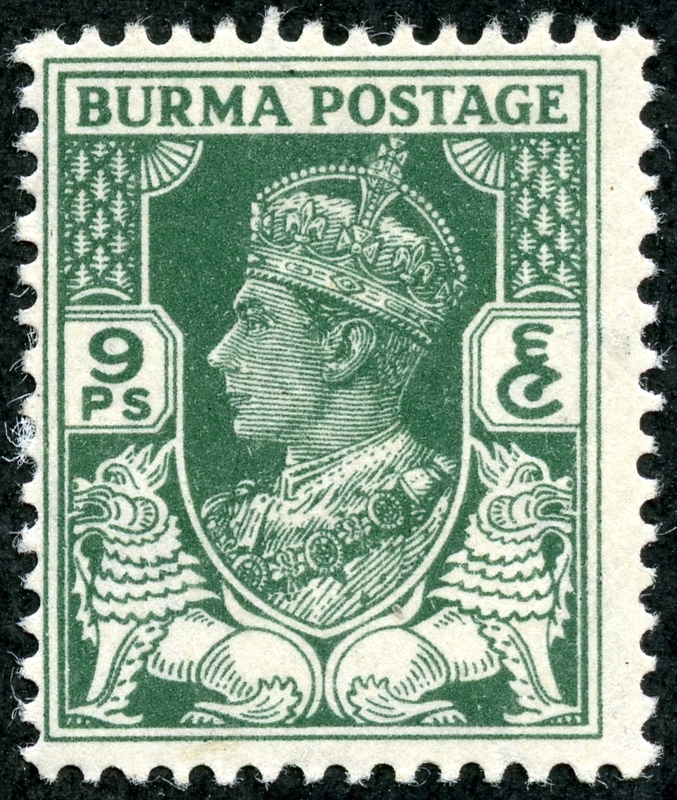 The higher denominations still show George VI, but with an overprint applied. 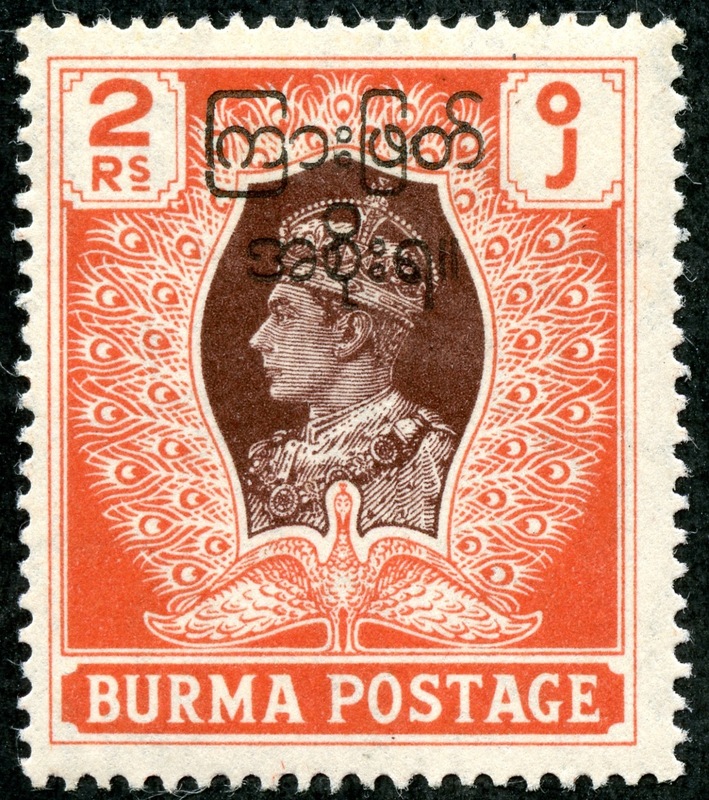 British Rule had seen better days. 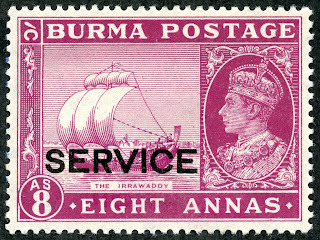 Likewise, "Service" stamps were created. 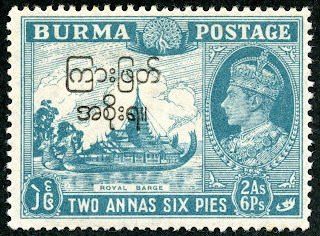 The 13 stamp Official issue of 1947 has a CV of <$1-$20+. 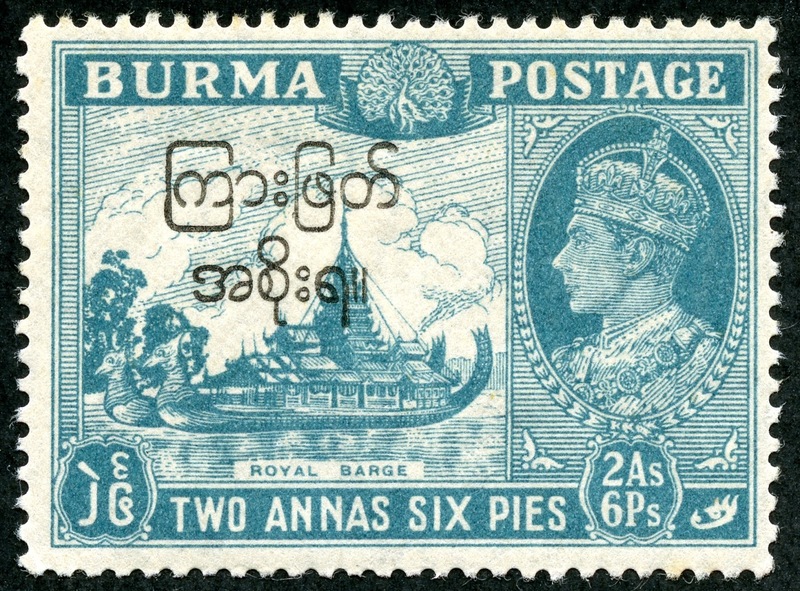 Note the "Nats" (Spirits), which are worshiped as part of Buddhism, depicted along the stamp frame here. Nats consist of 37 Great Nats (human beings who met violet death ("green death"), and the rest (spirit of trees, water etc). Deep Blue (Steiner) has nine pages for the 1937-47 stamps issued by the British administration. All of the Scott major numbers have a space. 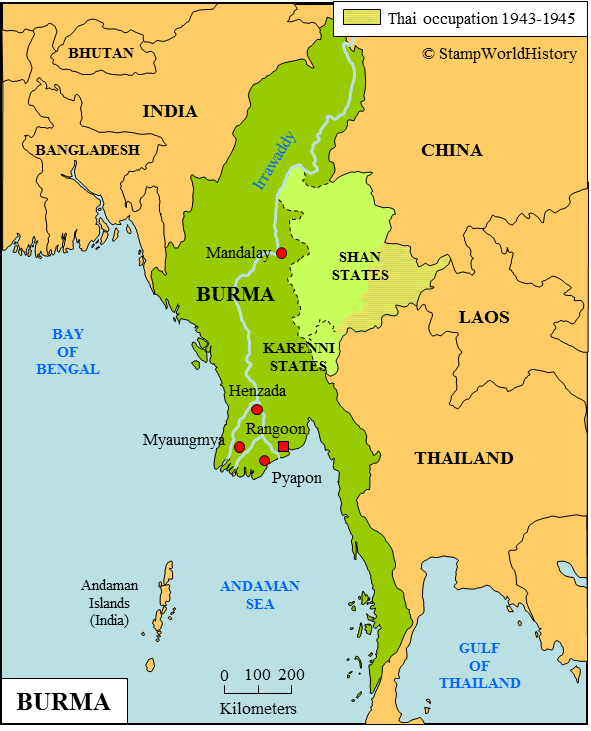 Burma (and Myanmar) are fascinating countries made more so by their self imposed isolation. 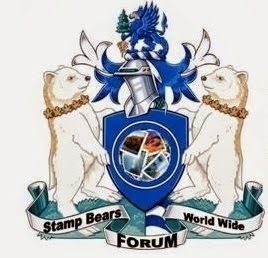 The stamps likewise. 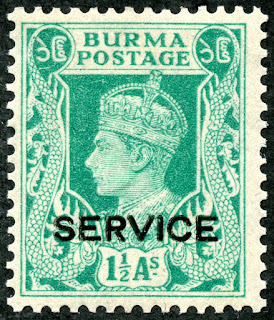 Next post: Burma Part 2 - Japanese occupation stamps of 1942-1944, and the issues of the independent Republic from 1948-1949. 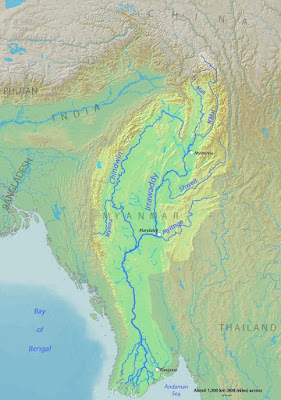 Note: "Irrawaddy" Map appears to be in the public domain. 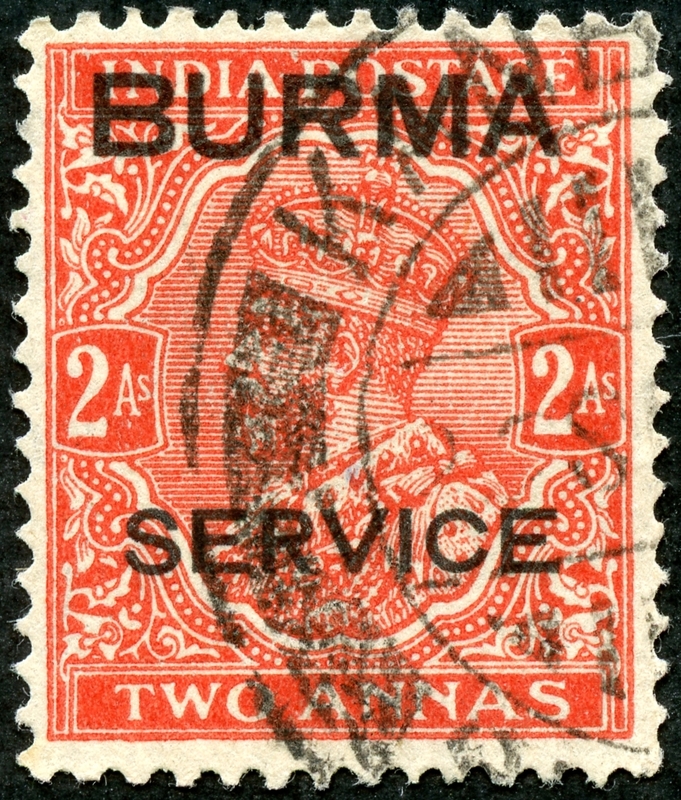 Burma Map - Stamp World History: Through prior correspondence, I had obtained general permission from Gerben to use his maps.